Program 1: "Functions & Relations"
Home > Program 1: "Functions & Relations"
In this program the student will begin with a review of the Field Axioms. 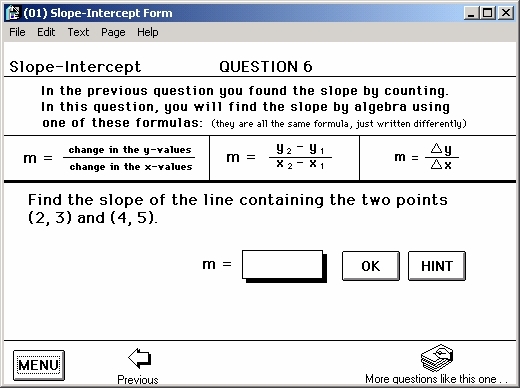 Students then proceed to the First Year Algebra MENU and learn: Slope-Intercept Form, Standard Form, Recognizing and Graphing Horizontal and Vertical Lines, Calculating and Graphing Parallel and Perpendicular Lines, and Recognizing a Function. 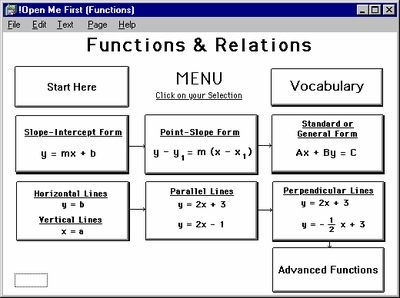 The Second Year Algebra MENU begins with Writing an Equation from the Given Information, Systems of Linear Equations and Graphs, Inequalities and Graphs, Absolute Value Equations and Graphs and, finally, Quadratic Equations.